Craving a Mexican-style meal mixed with a little sports or perhaps a night out on the town? From the minute you walk in the door of Tequilas Sports Bar and Grill, you realize there is a passion for great Mexican fare, creative and unique décor, and a room filled with people and fun whether watching their favorite NBA game on one of the many big screen TVs or dancing the night away during Latin Night late night! Yes! You heard that right! 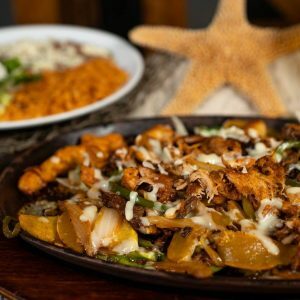 A fusion of sports bar food and Mexican dishes, this locally-owned option for delicious Mexican cuisine in Miramar Beach combines traditional, authentic Mexican recipes with local coastal tastes and bar type fare. The colorful menu is filled with signature dishes, but also beckons you to create your own taco, burger or combo and includes daily lunch specials that will keep you completely satisfied, Monday through Friday, for $8.99. Appealing to both the authentic Mexican foodie and the casual diner, some of our favorite menu options include Quesadilla Mexico and the Tequilas Bowl—both chock full of meat with a great taste! We’ve also ordered the garlic parmesan wings—very tasty, topped off with an order of garlic shrimp that came with rice and refried beans—delightful, spicy goodness! With an authentic, but fresh take, Tequila’s menu also includes Fajitas, Salads, Burritos, Quesadillas, Buffalo Shrimp, Nachos, Loaded Fries, Southern Fried Pickle Chips and even Wings (a sports-watching staple)—you choose your own sauce. And did we say Margaritas? They’re 2 for 1 every day! And a great way to begin your meal! With a plethora of TVs situated all around, a custom-built bar and artistically-designed walls and interior, as well as a vast selection of premium tequilas and “Latin Saturdays,” Tequila’s has become a local favorite. Margaritas, live music every Friday, 6 to 10 p.m., Latin Saturdays 10 p.m. to 2 a.m. where you can Salsa, Latin Trap, Bachata and Merengue to music by DJ Alacranero and lots of drink specials await. Open 11 a.m. to 9:30 p.m. Monday – Sunday; 11 a.m. to 2 a.m. Friday and Saturday.